Simply Read Books, 9781927018255, 217pp. IN SEARCH OF STOLEN SECRETS . . . For over a thousand years, the Box of Whispers has guarded the most precious treasure in the Land of Een. 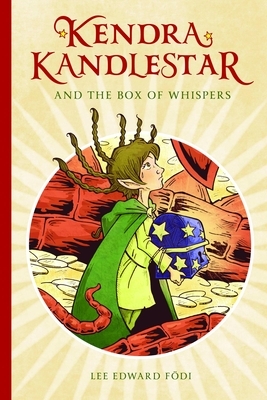 But when the box is suddenly stolen, young Kendra Kandlestar finds herself swept away on a magical adventure where doors speak in riddles, plants cast dangerous spells, and strange creatures lurk in every shadow. With only a handful of enchanted carrot seeds to help her, will Kendra be able to overcome these perils and find the fabled chest? There’s only one way to find out: peer inside the Box of Whispers and discover a world of magic, monsters, and mystery! Growing up on a farm, Lee Edward Fodi was subjected to various horrible chores such as cleaning up after chickens, pigs, geese, and younger siblings. There was a time when his father harbored hopes that his son would take over the family business but these aspirations came to an abrupt end when the young author accidentally ran the tractor over his dad s outhouse (thankfully, his dad was not inside at the time). As a result, Fodi went on to pursue his love of art, mythology, and storytelling, all of which (luckily) do not require any skill in operating heavy machinery. He is the author and illustrator of "The Chronicles of Kendra Kandlestar" and has also illustrated several picture books, including "I ll Follow the Moon" and "The Chocolatier s Apprentice," a Canadian national bestseller. When he is not writing and illustrating, Fodi spends his time teaching kids how to daydream through his fun-filled creative writing workshops. He enjoys travelling, and especially exploring castles, mazes, tombs, and temples not to mention tiny places hidden between the cracks of here and there."